In honor of Oktoberfest celebrations in Munich and around the world, we're happy to share with our fellow beer aficionados that yes, there is indeed a 'Wiesn Nebel', which would translate as 'Oktoberfest Nebula' or for some, it is the giant space stein known as the 'Beer Nebula'. Well, the cosmic keg is actually an interstellar gas cloud, but we're going with Wiesn Nebel...because it's Oktoberfest. 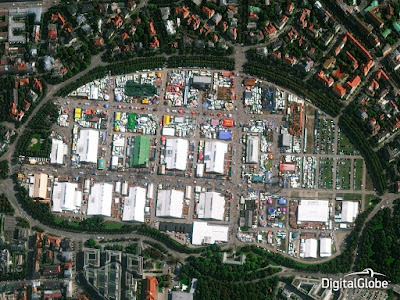 In Munich, Oktoberfest is known as "Wiesn" after the fairgrounds where the event takes place, Theresienwiese. Add that fact to the well known gas cloud near the Aquila constellation which is made up primarily of ethyl alcohol - the same alcohol found in beer, wind, and liquor - and you get what we're calling the "Wiesn Nebel". Located 10,000 light-years away and over 1,000 times the diameter of our solar system, the nebula could serve up over 400 trillion pints of beer. Intergalactic alcohol was first discovered in 1975 by UCLA astronomer Ben M. Zuckerman. Our massive Wiesn Nebel was later discovered in 1995 by British astronomers Tom Millar, Geoffrey MacDonald and Rolf Habing. Try remembering that after several Maß at Munich Oktoberfest! Cocktail Pairing: easy...your favorite Oktoberfest beer! Brown, M. 1995. Alcohol-Laden Cloud Holds the Story of a Star. NW Times. Miller et al. 1995. The detection of hot ethanol in G34.3+0.15. Monthly Notices of the Royal Astronomical Society.